I'm abbreviating names and trying to avoid too much identifiable detail, as publicity has previously brought people some very uncomfortable attention from the government. 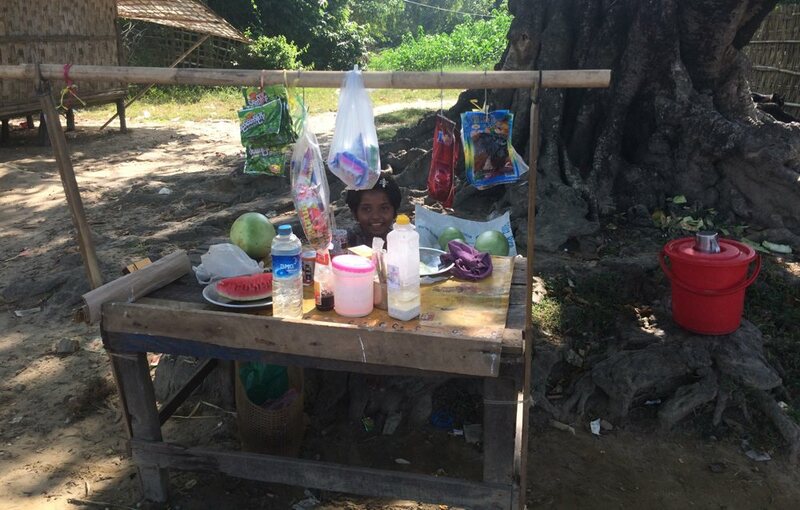 While the Myanmar government are unlikely to be reading my blog, I'd prefer to avoid any possibility of making life even worse for any Rohingya. Also, ‘we’ refers to our group as a whole; I was more a bystander than an active participant in most of what is described below. 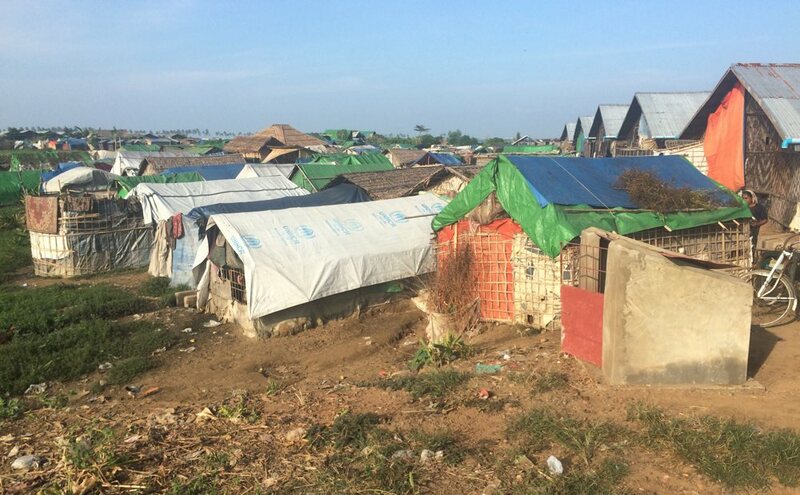 There are 150,000 Rohingya (ro-HIN-jya) people trapped in the sprawling network of camps outside Sittwe. Most of them moved there during attacks led by Buddhist monks in 2012, when their houses were burned and many of them killed. 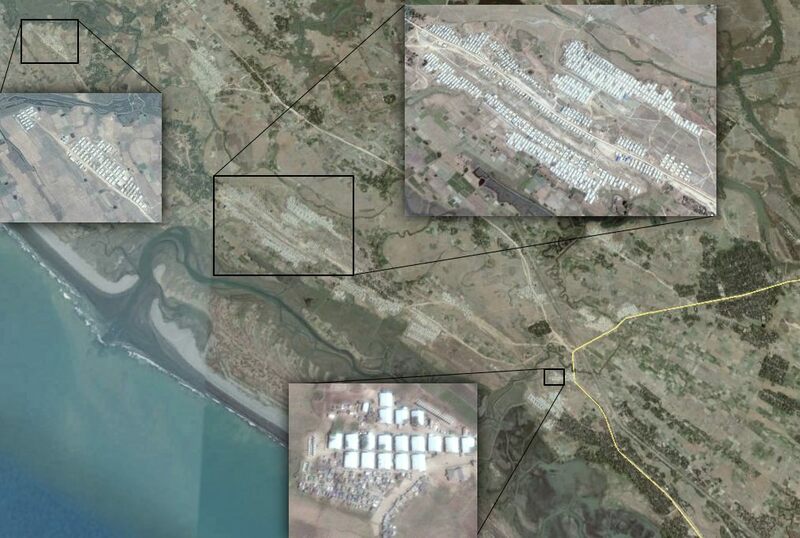 The others already lived in villages in the area, their villages absorbed by the camps growing around them. The camps spread about 10km from one end to the other, linked by potholed dust roads (and in places just tracks through rocks and riverbeds.) Some transport is available – a few passenger trucks, bicycles with a sidecar bolted on, some tractor-like things, scooters, motorbikes, and jeeps. After sneaking our way through the airport, separately and not talking to each other so as to avoid attention from the permanent local secret policeman, we completely blew our cover when a friendly member of the UN OHCHR offered us all a lift. The presence of two UN officials and a CNN crew on our flight seemed to have diverted all attention anyhow. We headed in across a rickety bridge, having switched to local transport. Below us, boats were being built on the mud-flats. Across the bridge was a crowded market. The truck squeezed its way through the market, across some railway lines, and stopped at M's clinic, to deliver her some supplies and training materials. M is not formally trained in medicine, so the government are trying to shut down her (completely unofficial) clinic. The problem with this is that the only way much of the camp gets any medical help at all is through unlicensed, learning-on-the-job, people like M.
There is actually a government clinic directly across the road from M's, and this is one of the arguments being used to try to shut her down. This would be fine, but for the fact that the government clinic had (up until this day) never been seen even unlocked, let alone operating. There are a few other clinics scattered through the camps, a few run by doctors and nurses from outside, others run by “community healthcare workers”, who receive enough training to deal with most of the routine issues that pop up in a camp like this. Unfortunately, we were told that many things normally easily dealt with – like diarrhoea, for instance – are still frequently fatal, and anything truly serious is big trouble. Our driver couldn't take us any further in without putting himself in danger (I was unclear whether from outside or inside the camp; he wasn't Rohingya), so we hired a jeep and driver to take us further in. We met H, whose older sister (a talented lawyer) and brother recently escaped to Bangladesh on a boat, where their future is by no means certain, but is probably slightly more hopeful than inside the camp. The Myanmar government doesn't care what happens to the Rohingya, they just want to stop them existing in Myanmar. One of the easy ways to achieve that is to put so much pressure on them that they'll jump on boats and make very risky voyages elsewhere, where they might have some slim chance of a better life. Packed 50 to a boat, they head for Bangladesh or Malaysia; they don't all make it, but many deem the risk to be a better option than what seems like certain slow starvation in the camps. 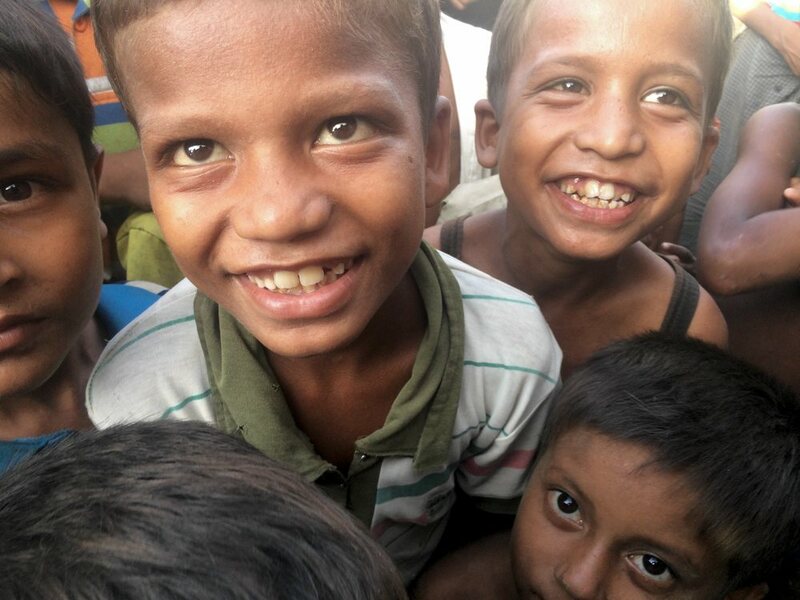 The government's ‘Plan B’ for dealing with the Rohingya is to ask them to sign a form declaring that they're not actually Rohingya, they're Bengali. Aside from the erasure of an entire people group, the bigger problem here is that everyone fears as soon as they declare themselves Bengali, the Myanmar government will decide that they belong in Bengal – i.e. Bangladesh – and just push them over the border, making them refugees with even thinner legal status. Ethnic cleansing doesn't require killing everyone. That's just how you get started. Rice was supposed to be delivered every 2 weeks, but the last delivery was three weeks ago. Parts of the camp were three months without food, and getting desparate. There had been not the slightest change in the overarching political situation; H was hoping to get on a boat herself before too long. We would hear “there is no future here” many times in our days here. Even (especially?) in situations like this, personal politics emerge and need to be navigated carefully. While the meeting continued, E and I excused ourselves and went for a walk down the road, through one of the original villages. Everyone was friendly and welcoming, but only a very few spoke any english. Those that did were desperate to practice it; if you can speak english you might be able to get work for an NGO, and not only would that be a decent job in a devastated job market, but it might be your ticket out of there. We got talking with 15 year old K. He'd grown up in the village, so had the (relative) advantage of still having a real house to live in, and having not lost any of his family's immediate wealth in the violence. 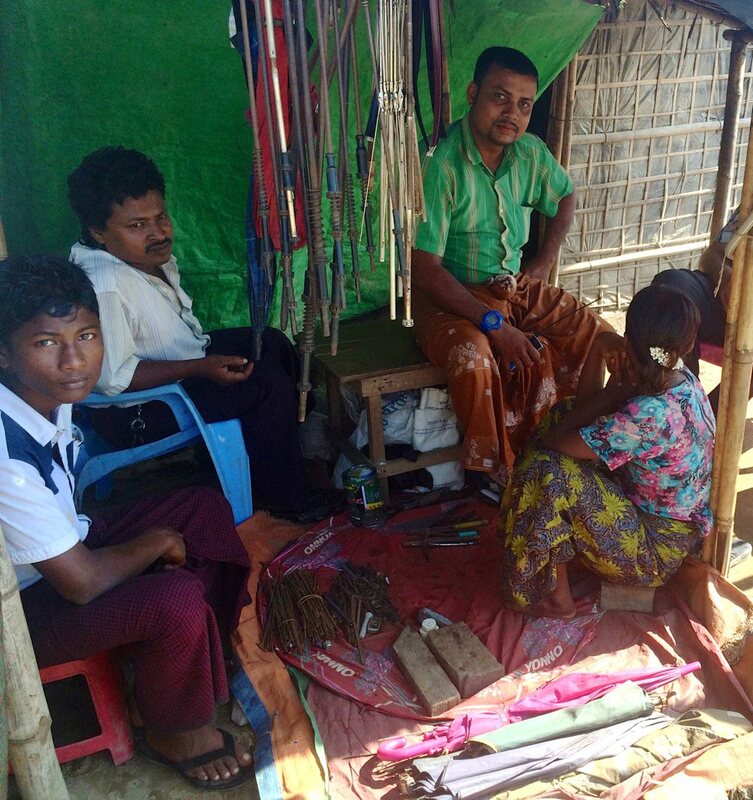 We were invited into a shop, which had for sale half a dozen busted umbrellas, a few rusty tools, and an assortment of metal scraps. Here, despite the circumstances, we were offered coffee. We walked a little more, then sheltered from the sun (and 35° heat) under a big tree, with maybe a couple dozen Rohingya men. The camp economy is barely existent, let alone functional, and the job opportunities likewise, so most people have not a lot to do outside of day-to-day survival. There's a lot of whiling-away-the-hours. Protein. They have enough rice to get by, most of it provided as food aid, a bit extra grown in the camp (although presumably the land and therefore the rice belongs to only a few wealthy people, who sell it to the others.) But there's a very limited supply of protein; how long do you think it takes to get up-to-speed producing enough meat, beans, or lentils for 150,000 people, inside a refugee camp? Citizenship. This is basically the only hope for the Rohingya; until they are recognised as belonging in Myanmar, they're done for. They're even discussing amongst themselves whether they'd trade away the ‘Rohingya’ name for citizenship (not to ‘Bengali’, but maybe something like ‘Burmese Muslim’.) This seems quite an abstract problem in the face of the immediate suffering and death, but it's why they're here and it's why they're stuck here, and it's why they've all but run out of hope. Such a fearful, hateful frenzy has been whipped up against the Rohingya that it's taboo to even say their name in Myanmar. The fear originates from the fact that (a) they're Muslim not Buddhist and (b), maybe a little because of (a) they tend to have larger families, so their population growth outstrips other groups in the area. The irony is that the Rohingya were (among other things) the primary day-labour/port-worker population of the area, so to fill those gaps migrant Hindu workers have been brought in from over the border, and a lot of people are just expecting the whole mess to happen again to the Hindu in a few years time. As we'd sat at this shop while talking to the guy, the woman running the shop had kept offering us things – a lone cigarette, betel leaves, yoghurt – and as we got up to leave she suddenly grabbed my arm and started gesturing at everything in the shop, gesturing at her (kinda blank-eyed, listless) baby, making the universal hand-to-mouth ‘I'm hungry’ sign. I suddenly realised – she was absolutely desperate for me to buy something, anything. Duh. The shop was slightly more permanent than the one above, and slightly better stocked – but only slightly. I finally left having paid sixteen times the retail value for a bottle of water, which (cue bitter laughter) made it pretty close to what you'd normally pay for such a bottle in New Zealand. He took us inside, and introduced us to the (also 15 years old) kid in the red shirt, who lets people make skype calls for 1000ks (NZ 10c) per minute, so they can keep up with relatives and friends who have made it to other countries. Solar panel, car battery, laptops, I didn't figure out where he was getting internet connectivity from. Imagine what this kid could achieve if he wasn't trapped inside a concentration camp! One thing that surprised me about the camp is that maybe 50% of the adult population – all the young adults, and everyone we dealt with – is carrying a smartphone. At first it's a really strange juxtaposition, until you remember that until a couple of years ago they all just lived in town and went to university or school or jobs like everyone else, and now they're living in a place where there are no landlines, no wired internet access, no electricity outside of the occasional solar panel. Of course they all have smartphones. Many of them also have educations, degrees, professional expertise. It's too easy to think of a refugee camp as a collection of generic victims, but we spoke to teachers, lawyers, bright ambitious kids, entrepreneurs – the kinds of people who would change the world in the right circumstances, but they're stuck in here, slowly starving to death. And starting internet cafés at the age of 15 while they do. On the way out of the camp that day, we spotted someone we knew and started yelling to him just as we passed the currently-filming CNN crew we hadn't seen in time. They shot us some frightfully filthy looks, and presumably reshot that segment, because our shouting (thankfully) didn't appear in the broadcast we saw a couple of days later. Hilarious but embarrassing. The government clinic was open for the first time ever, staffed around-the-clock with three nurses and during the day by a doctor, right when a CNN crew were in the camp. The CNN crew were in the camp because Obama was to arrive in Myanmar the day we left. While he was in the country, to our satisfaction, Obama talked directly and publicly about the Rohingya, at odds with everyone in Myanmar refusing to even speak their name. The second day started with a visit to ‘Grass Hut Village’. The people in this part of the camp had lived in the high school for a while, crammed in like sardines, until the village wanted the school back. They then lived in grass huts for a time, until they were promised permanent accommodation and registration (entitling them to food aid/rations) if they were willing to move to the far end of the camp. A group of them, taking advantage of the promise offered, moved right out the end, only to be betrayed. They are now 3 times ‘internally displaced’, far away from everything, and they still aren't allowed to register. The rest stayed put, and Partners bought a bunch of tarps so they could at least have waterproof dwellings for cyclone season. They're only 2 times internally displaced, but living in tarpaulin tents. Neither group is registered, neither group is able to register, despite all the promises, which means that neither group (between them 1015 families, maybe 5000-6000 people) receives any government aid. They were the group that hadn't received any food at all for 3 months. They claim (and others concur, and it seems pretty likely to be true) that they are being punished. During the violence two and a half years ago they fought back, and one of their attackers was killed. Ever since then, this group has experienced even worse treatment than the rest of the Rohingya. Rice bought (around US$5000 to feed 1015 families for a month) and delivery organised, we went to visit the group who moved out to the end of the camp, and await the rice. To illustrate just how punitive and irrational this ‘non-registration’ business is: they still delivered some rice to this village. They carried sacks from the next village, right through the middle of this one, and stacked them up the far end, for the dozen families in the village who belonged to a different people group, and are able to register. They'll walk aid rice right past 500 starving people and pretend they don't exist. This happened while we were talking to the community leader (via a translator, in a kind of ‘town hall meeting’ with several dozen people present.) It was one of the many cruel and awful circumstances the leader explained to us without a hint of emotion. It makes it really tricky to get a real handle on the suffering when the culture puts such high stock in not showing emotional vulnerability. I was absolutely breathtaken by the things the community leader could say without a crack in his voice or even a grimace. Things that I wouldn't have been able to say without bursting into tears or getting choked up, he managed with a small shrug and not even a flicker of expression. His strength was amazing. H had shown us the same talking about people dying on boats, and S had shown us a photo, without changing tone or expression, of a guy who had been beaten and shot dead by police. We couldn't do much about the clothes and so on, but B immediately took a jeep down to the market to buy enough oil, onions, garlic, and chillis to satisfy that need. As we were driving back to the camp entrance, our translator S (who is 18) discovered that I'm a computer programmer, and was thrilled. He'd love to learn how to build a website to help his community coordinate and share news. Could I teach him how to build a website? So my next project is figuring out how that would work. How can I help fix it? Thank you for this. Heartbreaking.